Austrian sculptor. He had his early training from various masters (including Zauner) before he joined the Viennese porcelain factory as a modeller. From 1812 he was in Rome, where he modeled his work strongly on Canova. He also made friends with Thorvaldsen, who became a great patron. 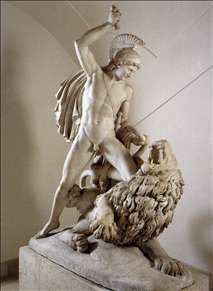 On receiving a commission from the court to work up a lifesize male statue of youthful age, he opted for a group based on Bellerophon Fighting the Chimaera. Schaller s weakness was that in his sculptures he was scarcely able to convey the sense of resolution that imbues Canova s sculptures. Despite his talent, he belonged among the ranks of his Austrian colleagues who remained long under the sway of the visual language of the Baroqque . See more details about "Bellerophon Fighting the Chimaera"